Treatment of acid mine drainage (AMD) produces large amounts of sludge that poses serious challenges for storage, dewatering, disposal or reuse. A Bishop Solids Management Solution, with Geotube® containers, provides a new approach that outperforms mechanical dewatering processes, such as belt presses, and even contributes to reliable containment of metal precipitate and dewatered sludge. With the Bishop Solids Management Solution, sludge can be pumped directly from the AMD clarifier to a Geotube® dewatering container. As the sludge is pumped, the Bishop VEPAS polymer system adds a specially selected coagulant directly to the feed line, eliminating the need for mixing tanks and immediately starting the coagulation and dewatering processes. The simple, low-energy process can be automatically controlled through the plant SCADA system, achieves excellent dewatering and produces high-quality filtrate. Geotube® containers have been proven to achieve excellent dewatering of AMD sludge, typically achieving nearly 30% solids within about 72 hours. Belt presses, on the other hand, can only achieve about 10% solids, consume far more energy and require significantly more maintenance. 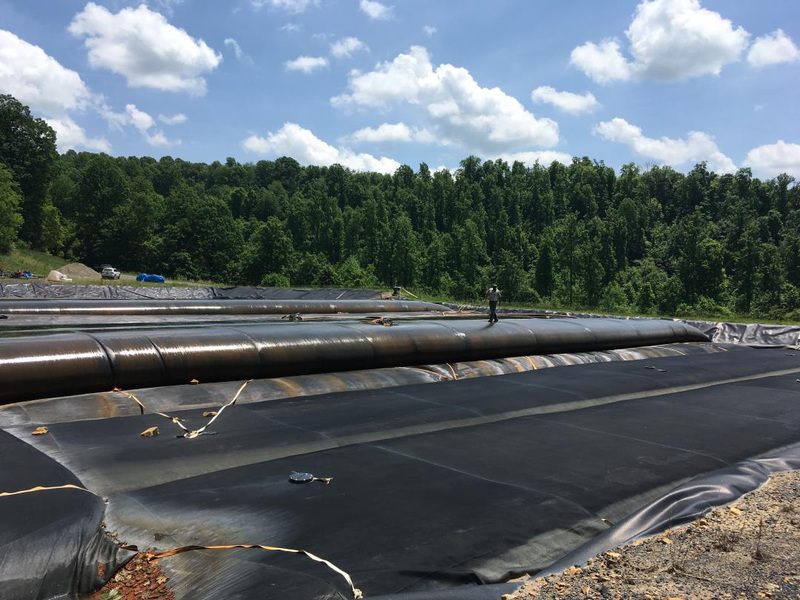 The Omega Mine in West Virginia has been using Geotube® containers for several years to dewater sludge produced by an AMD treatment plant. The plant receives raw water at a rate of about 200 GMP (46 m3/hr) and uses lime to raise pH from about 2.5 to 7.0. Chemicals are also used to capture heavy metals and reduce the concentration from about 1,985 ppm to less than 3.73 ppm. Treated effluent from the plant and the Geotube® dewatered sludge is discharged to the local receiving body. Once dewatering is complete, Geotube® containers can remain on site in the lined lay-down area and multiple layers of containers can be stacked on top of one another. The plant is currently participating in an innovative research study to reclaim rare earth metals from the dewatered sludge. Researchers believe the sludge contains high concentrations of rare earth elements, which when harvested, could be worth more than $800,000 per year. We’ll tell you more about this story in a future issue of the Bishop Water e-newsletter. containers for mining and mineral processing. Contact us to discuss your dewatering needs.